Olive Leaf Mint Tea is a great-tasting drink that can be taken daily as part of a regular healthy diet. However, when you are feeling sick or coming down with the flu, what a wonderful way to brighten your day. Seagate grows the olive leaves contained in this product on their farm in Baja California. Seagate freeze-dries the olive leaves, employing the same process methods used to produce olive leaf extract. 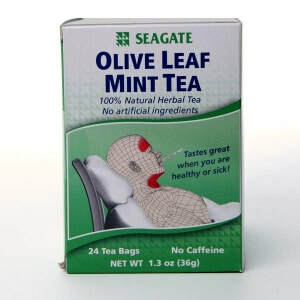 Peppermint leaves are added to provide a pleasant soothing flavor. Seagate's olive trees are well-suited to the arid climate of northern Baja California. Originally, these trees were planted alongside their farmland to protect the crops from wind damage. ​The mighty olive tree (Olea europa) has been celebrated for its power to nurture and heal since the beginning of recorded history. Cultivated in Asia Minor over 6,000 years ago, the fruit and the oil of the olive tree are mentioned in the Old and New Testaments as health-promoting and life-sustaining foods. Olive leaves were used by the ancient Egyptians to wrap and preserve their mummies prior to burial in crypts, because the olive leaves helped preserve human tissue from decomposition. It would be thousands of years before the olive leaf would be studied for its antimicrobial characteristics. In 1969 a major pharmaceutical company isolated a component of olive leaf, a chemical called elenoic acid, in an attempt to develop an anti-viral medicine from this plant. Perhaps the most famous modern use of this tree is by The United Nations which uses the olive branch as its symbol of peace.